Here is a look at just some of the places to visit near Whitby and the activities you can enjoy for the perfect North Yorkshire holiday or short break for you or the whole family! The North York Moors is a really special place – unique in that it is situated close to the coast, it enjoys an unbeatable combination of sea views and dramatic coastlines alongside vast heather moorland and rolling hills inland. Unsurprisingly, the North Yorks Moors National Park offer a huge range of activities for nature and outdoor-lovers to enjoy, from climbing to cycling, walking to fishing and horse-riding to wildlife-watching. Adventurous-types can enjoy tree top adventures, bushcraft, canoeing, mountaineering and more from their base in Whitby, Cloughton, Staithes, Thornton Dale, Cropton and any of the other great towns and villages found in this area. Fans of TV’s Heartbeat will recognise the moorland village of Goathland as ‘Aidensfield’ – the quaint but petty-crime ridden village patrolled by PC Rowan and friends. But that’s not the only claim to fame this pretty unassuming village enjoys – its train station also doubled up as Hogsmeade station in the cult Harry Potter films! As you can imagine, its location makes it a fantastic place for walkers. You can follow the ‘Rail Trail’ from Goathland to Grosmont for three and a half miles, exploring the sites along the way before heading back on the train. Alternatively, take the Mallyan Spout footpath to see the pretty 21 metre high Mallyan Spout waterfall. Other walks include Grosmont to Beck Hole and the longer Ravenscar to Robin Hood’s Bay walk, taking you through some of the North York Moor’s most iconic landscapes. The southern North Yorkshire Moors is home to Dalby Forest, known for its ‘Rigg and Dale’ landscape which makes it perfect for outdoor adventures. It is here that you will find ‘Go Ape’ the UK’s favourite Forest Adventure Experience. Choose from two to three hours of treetop fun across high ropes, bridge crossings, tarzan swings and zip wires, or a Forest Segway Experience where you will learn to master the segway whilst exploring off the beaten track! Take time also to visit the Dalby Moors Activity Centre where you can enjoy outdoor activities such as paintballing and airsoft along with archery. One of the UK’s top tourist destinations in its own right, Scarborough is definitely worth a visit whilst exploring the North Yorkshire Moors. Its award-winning sandy beaches, dramatic coastline and plentiful attractions make it a favourite with couples, friends and families alike. Like the rest of this region, there are plenty of outdoor activities to enjoy including Donkey Rides along the beach or a visit to famous Scarborough Fair, however there is plenty to do indoors too. Why not visit the Sealife Sanctuary to get up close and personal to sharks, rays, penguins and more. Alternatively, take a walk up to 2500 year old Scarborough Castle, perched on a hill overlooking the sea. On a nice day you can even pack a picnic and enjoy a spot of lunch overlooking the coast. You can also take a trip out to sea on board the historic ‘Hispaniola’ which takes visitors on a 15 minute trip around the South Bay, or if you are looking for something a little faster, enjoy a thrilling speedboat ride around the harbour! A small but beautiful fishing village close to Whitby, Sandsend is perhaps best known for its miles of sandy beaches. You can walk to Sandsend from Whitby along the coast, as well as into nearby Mulgrave Woods to take a look at the remains of Mulgrave Castle. Other activities in Sandsend include rock pooling and fossil hunting, whilst history buffs will be interested to see the old coastal railway and alum works – you can follow the trail around the quarries and along the railway with a trail map available from the tourist information centre. We can’t continue with our overview of places to visit in the North Yorkshire Moors without mentioning Whitby itself. The haunting Whitby Abbey is one of the town’s most famous, and striking attractions. Towering above the coast high on a cliff top, the Abbey looks particularly striking at night when it is all lit up, and it’s not hard to understand why it became the inspiration for Bram Stoker’s ‘Dracula‘. It was this gothic inspiration that gave birth to the bi-annual ‘Goth Festival‘, usually held in April. This music festival attracts goths, metallers and celebrants of alternative lifestyles from across the UK! 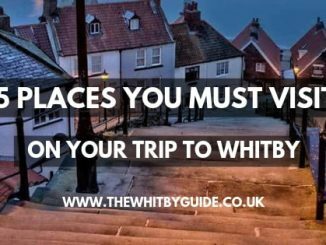 View our full list of things to do in Whitby. This pretty market town is known as the food capital of Yorkshire and hosts the yearly Food Lovers Festival every May. Each month too, there is a fantastic food market and you can explore all of its famous food heritage on a ‘Made in Malton Food Tour’. The tour will take you to see traditional artisan producers found in and around Talbot Yard, or you can choose to sample the local food yourself in the town’s restaurants and delis. Malton is also home to the family-friendly Flamingo Land Theme Park and Zoo, the UK’s most visited zoo! Billed as the ‘ultimate’ thrill, the zoo offers a number of ‘zoo-keeper experiences’ such as the Meerkat encounter, Giraffe encounter and ‘animal trainer experience. The theme park meanwhile features exciting roller-coasters, rides and experiences across seven uniquely themed areas. A busy market town on the edge of the Moors, Pickering is the perfect place to begin a journey along the historic North Yorkshire Moors Railway. Start with a visit to the Beck Isle history museum to learn all about Pickering’s history or head to Pickering Castle. This 13th century castle has doubled up as a hunting lodge, holiday home and stud farm for medieval kings throughout the centuries and is now looked after by English Heritage. Then, refuel with a meal at Mulberries Tearoom and Terrace in Pickering Station, before boarding your train to Whitby, stopping at Levisham, Newton Dale Halt, Goathland and Gorsmont along the way. Such a wonderful region as the North Yorkshire Moors, as you can imagine, has so many natural and historic wonders to explore that it is impossible to list them all. What’s great is that the transport links, footpaths and cycling paths winding from Whitby to nearby towns, villages and attractions, mean that there are plenty of places to visit near Whitby. And if you run out of time, you’ll just have to come back again! Want to visit these places in the future? Pin it!